Farr, D.m.l.. "Sir Samuel Cunard". The Canadian Encyclopedia, 04 March 2015, Historica Canada. https://www.thecanadianencyclopedia.ca/en/article/sir-samuel-cunard. Accessed 19 April 2019. Sir Samuel Cunard, merchant, shipowner (b at Halifax 21 Nov 1787; d at London, Eng 28 Apr 1865). Sir Samuel Cunard, merchant, shipowner (b at Halifax 21 Nov 1787; d at London, Eng 28 Apr 1865). Cunard joined his father in the timber business and with interests that expanded into whaling, lumber, coal and iron as well as shipping, he amassed a large personal fortune by the 1830s. His shipping activities largely encompassed sailing ships, although he had some experience in early steam navigation as a shareholder in the wooden paddle wheeler, the Royal William, which in 1833 made an historic crossing of the Atlantic, mainly under steam power. 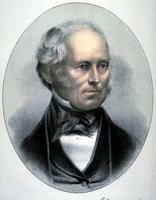 Among his business interests, Cunard was a founder of the Halifax Banking Company in 1825 along with Enos Collins. 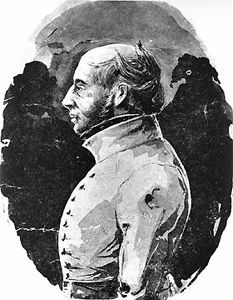 A Tory supporter, he was a member of the Council of Twelve 1830-38 and of the NS Executive Council 1838-40, although he was active in council meetings only for the first 3 years. In 1839 he submitted a bid to the British government to undertake a regular mail service by steamship across the North Atlantic from Liverpool to Halifax, Québec and Boston, for £55 000 annually for 10 years. The bid was successful, and in the same year Cunard, with associates in Glasgow and Liverpool, established the British and North American Royal Mail Steam Packet Company, the ancestor of the Cunard Line. The first Cunard sailing was made in May 1840, but the paddle steamer Britannia began regular mail service by steam that July by crossing from Liverpool to Halifax and then Boston in 14 days and 8 hours. Although Cunard had severe financial difficulties in his NS and NB businesses in the early 1840s, his shipping operation, well managed and technically innovative, prospered. It relied on iron ships after 1855 and on screws rather than paddles by the early 1860s. It was forced by stiff competition from the US to drop Halifax as a regular port of call and send its vessels directly to New York in 1867. There were no Cunard sailings to Canada until just before WWI, but thereafter service was maintained from Montréal until air transportation brought about its demise. Cunard moved to England to supervise his shipping interests, was made a baronet in 1859 for the services of his vessels in the Crimean War and died in London. He left an estate estimated by some at £350 000, by others at considerably more. He was the largest of PEI's absentee land proprietors by 1860 (seeLand Question, PEI), and his holdings there were sold in 1866 for some $258 000.